Our 35×7 construction non-rotating wire rope will be suitable for a range of offshore lifting applications, including as part of a ship crane assembly. 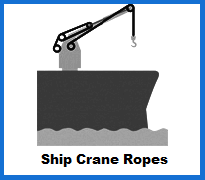 The ship crane ropes 35×7 non rotating construction has superior strength and the ability to eliminate any chance of the load rotating make it a popular choice. When performance and durability are of paramount importance, choosing our 35×7 construction non-rotating wire rope for your ship crane will be the best decision. The configuration of the galvanised steel wires means that the dangers of handling heavy loads in marine environments will be significantly reduced. You can use it to replace a damaged wire rope without sacrificing safety. There are lots of diameter options in this particular wire rope category, stating off at 28mm and rising to 48mm. Breaking loads change along with the diameter, running the gamut from 760.8kN up to 2236kN. Our 35×7 construction ship crane rope is just the start, as you can find wire rope for dockside cranes, mobile lattice boom cranes, piling cranes and plenty of other equipment types on our site. Each product is manufactured with quality and reliability in mind, so you can be confident when you buy with us. If you want to order any of our crane rope products, or need a bit of guidance before you make a decision, please get in touch. Dial 01384 78004 and a team member will talk you through what you need to know. Email us for a fast reply today. 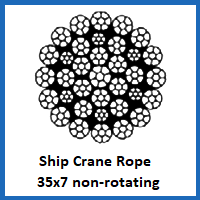 Ship Crane Ropes 35x7 Non Rotating Construction Overall rating: 5 out of 5 based on 6 reviews.